New technology is weaving fresh life into the fabric of old industry tucked away in rural west Wales. 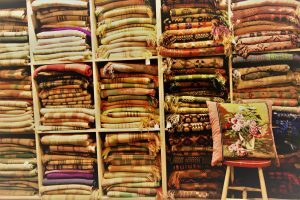 Ceredigion based Jane Beck has one of the largest stock of new, vintage and antique Welsh blankets in the world, with a well established business which has gone from strength to strength over the past 12 years. The growth of online services has allowed her to promote products from local looms to a fresh audience, boosting sales and interest thanks to her vision of merging traditional creations with the internet era. Jane has worked hard to publicise these vintage wares to wider customer circles, and hers was the first website to include blankets of this kind, which in turn has inspired others to share information about these items and their history. The company has successfully embraced the potential of social media tools such as Twitter, Instagram and Facebook, and the vintage style has steadily become a more fashionable choice of home decor. 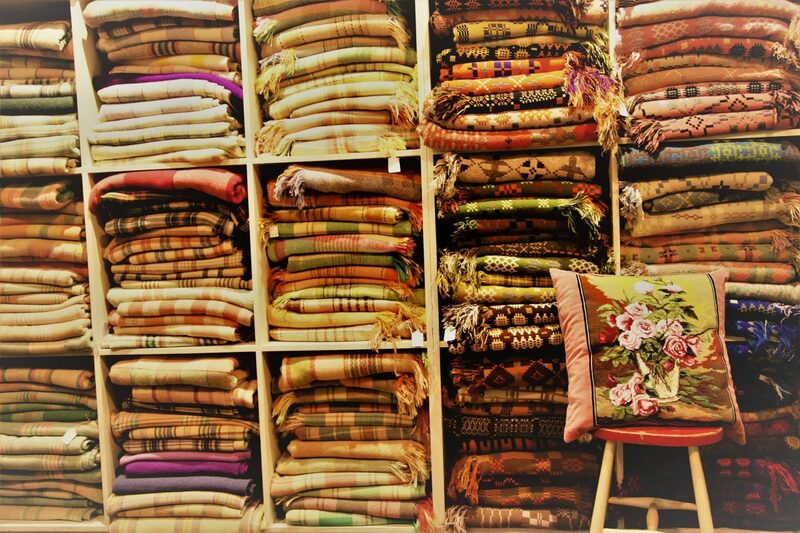 Welsh blankets and quilts piled high at Jane Beck’s stylish premises. Her online presence has helped her become the ‘go-to’ person for people seeking or selling vintage blankets, with the oldest in the shop currently dating back to 1830. The majority are from the turn of the 20th century, and are mainly sourced from the upper Teifi Valley, with some rare and collectable examples among her stock. The attraction to customers is a combination of style and the stories behind them, depending on the individual. Jane said: “It’s often about a familial connection, for people with roots in a certain area. I can tell who wove some of the Ceredigion ones. Jane has a keen interest in the social history associated with the industry and her blankets have appeared in period dramas, theatre productions, and home magazines. Her unique shop is an Aladdin’s cave of curious textiles from the 19th century to present day, and she has extensive knowledge of their origins and care needs in modern homes. For more information about Jane’s stock visit www.welshblankets.co.uk.